The video below provides a quick explanation about a 3D printed flute. Using the powerful Objet500 Connex, this wind instrument’s 3D model was produced using Rhino. Its’ bulky wooden outer shell provides a stern contrast to the graceful sounds it can produce. Bhatnagar even took his masterpiece to the streets, inviting different violin players to fiddle away. Check out the videos here! How Can 3D Printing Save You Money? Are you a person that likes to carefully plan out your savings? Do you intend on saving up for that much needed holiday? If your answer is yes, then you may want to look into purchasing 3D printed products! We’re all aware of the extensive list of 3D printable objects – from common household items to expensive designer clothes and movie props. Its no surprise that reports from varying new sources are claiming that 3D printing can save us all a lot of money. But how, and just how much? CNN reported on a study conducted at the Michigan Technological University, which involved researchers printing 20 different items. Upon comparing these items – which included objects such as shower heads, iPhone cases and spoon holders – to the equivalent ones available at online stores, they were astounded at the gulf in prices. Redorbit also reported on this phenomenal discovery, claiming that Joshua Pearce, the head researcher, said the number could reach as high as $1,900 based off their calculations. Of course, if a 3D printer would simply churn our cheap products, everyone would be doing it by now. Regardless of the big savings, most people would hesitate to spend their leisure time enthralled in a time-consuming DIY project. That’s were Malta 3D Printing comes in. Our quick and easy service allows customers to print a huge selection of items, all of which would still save tremendous amounts of money compared to their store bought cousins.Quality does not have to cost an arm and a leg, just ask us for a quote! Pearce recently released a study which found families can save between $280 and $1,900 by printing some their own basic household items rather than buy them online. Pearce claims the relative ease of use and a growing community of 3D printing enthusiasts is making the technology a household phenomenon. 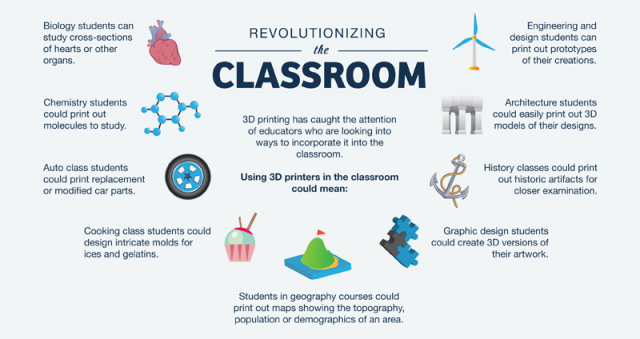 Modern universities around the world have successfully endorsed 3D printers in the classroom. Students from all walks of life are creating innovative products, rivaling the originality and ingenuity of high-end companies. They’ve created interesting products like boats and augmented reality headsets, to name a few. While many of these institutions at the top of the educational hierarchy are focusing on additive manufacturing, what about those lower down the learning tree? Imagine the possibilities of having small, user-friendly 3D printers in our children’s classrooms. Computers provided a tremendous leap in learning potential, proof that accepting modern means of learning can pay dividends. Malta 3D Printing’s Facebook page recently featured an interesting infographic regarding the myriad of different uses 3D printers would have in a classroom. Titled ‘Revolutionizing the Classroom,’ the picture explains how printing could impact 9 different academic subjects – from biology and chemistry, to graphic design and history. The global surge in interest in 3D printing has even lead to books being written specifically for teachers seeking to use a printer in the classroom. One of the more recent additions is titled ‘The Invent To Learn Guide to 3D Printing in the Classroom: Recipes for Success‘, by Norma Thornburg, David Thornburg and Sara Armstrong. Available on Amazon, the step-by-step guide has received plenty of positive reviews. It presents 18 stimulating printing projects – covering a wide range of subjects including mathematics, engineering and science. For educators less comfortable with certain technical aspects of 3D printing, this book is definitely for you. It is crucial that we introduce these technologies at a young age, allowing for children to get accustomed to them nice and early. The usual naysayers – Luddites and technophobes – may resist such a transition, as they did when desktop computers slowly made their way into the classroom a couple of decades ago. However, provided all goes well, 3D printers can become a bastion of educational technology! It’s perfect for allowing children to explore their imagination, simultaneously widening their range of creative skills. Furthermore, it encourages kids to keep trying even after they’ve failed, as printing itself requires trial and error. So often, children are frustrated by failure, yet 3D printing allows for an environment which accepts it with open arms. It’s nice to know that messages from the printing industry aren’t falling on deaf ears. As far back as 2009, projects like KIDE have begun infiltrating classrooms in the UK. Started by Dejan Mitrovic – a technological pioneer – his educational scheme focuses on bringing 3D printing into the classroom, focusing on a ‘think-create-use’ model. This Vimeo video captures the KIDE project in action – displaying the students’ work in a 2 minute slideshow. On the other side of the pond, an article by Redorbit tells us about 12 groups of teachers who visited the Michigan Technological Institute to learn more about 3D printing. They were effectively given a crash course, ensuring they return to their respective schools with a decent understanding. Slowly, but surely, the world is embracing 3D printing. It’s only a matter of time before it spreads across the globe! Perhaps one-day the children of the future will begin community altering projects in their very own classrooms. We’ll open our newspapers to read about a local group of boys and girls who helped to pioneer a contraption of the future. All we must do is provide them with the tools and proper guidance – then sit back in awe as we watch the cogs in our little men and women’s brains turn. Today we’ll be taking a look at a few awesome 3D printable products which have officially reached ‘life hack’ status. Amidst our more serious blog posts, this entry will be about easy-to-use, and more importantly, easy-to-make products which may not change the world – but will definitely help to put a smile on people’s faces. Here’s one for the fruit-loving house party hosts – a printable tap which transforms a watermelon into a keg! All you require are the beverages of your choice, and a knife to cut open the watermelon. Remove the melon chunks, add some ice, pop your tap into the makeshift fruit keg and prepare to conquer your thirst! These fun products are great for a family day by the pool or to provide some much needed novelty at a house party. The tap is the result of a combination between a team dedicated to life-hacking and a 3D printing company started by the people, for the people – Household Hackers and Robo 3D, respectively. According to 3DPrintingIndustry.com, this nifty tap was created using a Robo 3D R1 printer. It can, of course, be used for more conventional purposes, but this one is by far the most awesome. Next up, we’ve got a nifty little item that packs a musical punch. The ‘Kazoo‘ – a handheld instrument which requires users to hum into it – can provide hours of sweet-sounding fun. Appropriate for both professional and amateurs alike, this small instrument definitely has mass appeal. It’s bound to have parents and neighbors across the globe in search for a fine set of ear plugs. Hours have been spent tooting away at the Malta 3D Printing office, with a trusty kazoo never more than a few feet away! According to the Guiness Book of World Records, on 14th March 2011, over 5,000 kazoo players teamed up to create their own rendition of one of Wagner’s greatest compositions, ‘The Ride of the Valkyries’. How many of those kazoos were 3D printed? Moving on, we present to our viewers a simple, yet handy product which is bound to help people save a few extra pennies. Have you ever known there was some toothpaste left in the end of the tube, but couldn’t be bothered to awkwardly squeeze it out? This trusty tube roller is meant for those occasions! Its incredibly easy-to-use, just fit it onto your desired tube and twist away. Guaranteed to squeeze every last drop out of your bothersome tubes. Don’t like the colour? Good thing Malta 3D Printing has dozens of alternatives. The item pictured below is a cool alternative to that annoying bunch of keys on a ring. This 3D printable Swiss army knife can hold a number of keys, and should fit into a pocket nicely. Say goodbye to that frustrating feeling you experience when you pull your mobile phone out of your pocket, only to realize its been scratched by your cumbersome key ring. Furthermore, printing this product in a nice bright colour will reduce the amount of time we spend looking for our keys! Finally, we bring to you another tool that can help you tackle another common nuisance. We’ve all gone through our fair share of mobile phones, speakers, and the myriad of other devices which come with 2-3 different cables per box. This cute cable spool allows you to store your wires in a practical way, and even when in use, guarantees things remain nice and tidy. These spools can be easily stacked on top of each other or placed side-by-side neatly, as opposed to simply having a pile of wires left in a dusty box under your bed. The examples listed here are only a speck of sand in the beach that is 3D printing. There are literally thousands of products out there that are can be immensely useful, or entertaining! Don’t hesitate to contact Malta 3D Printing for any of the items listed above! So far we’ve covered plenty of interesting printing related gadgets and projects – but what about the names and faces behind these marvelous projects? Who are the inventors and pioneers that helped propel 3D printing to the pedestal it currently sits on? One cannot give recognition to the lesser names in the 3D printing world without first mentioning the mastermind that is Chuck Hull. He is the father of stereolithography, the first link in the chain which lead to different types of manufacturing, all under the 3D printing umbrella. A visionary, Hull also invented the STL file type and the rapid prototyping technique – all critical pieces of the 3D printing pie. He is reported to have over 60 patents in the USA alone. Hull’s passion for his creation lead to him founding 3D Systems Corp. Established in 1986, it stands tall and proud as the world’s first company dedicated to 3D printing, and is still the market leader. Currently 74, his desire to continue to lead his company clearly hasn’t waned, and he still operates as the Chief Technical Officer and Executive Vice President. The metaphorical light bulb above Hull’s head lit up back in 1983, when the entrepreneur was working for a small business that used UV rays to place layers of plastic onto tables and other furniture. Envisioning a method which involved using light to mould plastic layers into 3D shapes, the cogs in his head began to turn. After months and months of experimenting, Hull’s dreams turned into reality – and a prototype was made. The printer pictured below was Hull’s first ever printer, a relic now over 30 years old! In case you missed out, last week’s post included a Chinese company capable of printing up to ten houses a day! While that is awe-inspiring, the Eastern firm must pay homage to Dini, the first to patent the technology to print large structures using 3D printing. Many years ago, Enrico Dini was a robotics specialist, and enjoyed experimenting with 3D printing in his spare time. Teaming up with his brother, he created his first prototype printer, eventually succeeding in printing a stone column, and more notably – the world’s first ever fully printed architectural structure. After this, Enrico Dini’s name became famous in the world of architecture. A documentary filmed by Marc Webb and Wake-Walker takes a look at Dini’s life as he balances work and family – at times, to his own detriment. A teaser of the documentary can be viewed here. In an interview with 3DPrinting.com, Dini states that his only wish is to be able to convert his current line of printers into affordable, simplistic machines for all to use. “My dream is to go to Africa, remove the weapons out of the hands of child soldiers and replace them with a basket. They can use the basket to collect sand and bring it to a 3D printer. This printer then builds small houses, irrigation canals, or parts for shading. Things that improve life for the people there,” Dini was quoted as saying. Our next contender for the printing pioneer award is one who claims that 3D printing is effectively lighting the fire for the third industrial revolution. His name is Tedd Syao – a man who, after analyzing the state of the 3D printing industry, saw fit to dedicate himself to improving its infrastructure from the bottom up – similar to how his revolutionary printer operates. As founder of Kudo3D, Syao was instrumental in the creation of the Titan 1, the next wave of SLA printers. Incredibly, the Titan 1 raised a staggering $687,000 dollars on Kickstarter in 2 minutes! According to Kudo3D’s Kickstarter page, Syao previously worked as a professor in electrical engineering, clocking in 15 years of hard work in the Photonics industry. Building on his unique set of skills and experience, Syao and his team crafted this trendsetting printer, available at the low cost of $1,999! SLA (stereolithography) printers differ from the conventional FDM (fusion deposition modelling) printers. Kudo3D’s entry into the market claims to improve the resolution, increase build speed and build space whilst focusing on reliability – effectively making it a top contender in the SLA domain. Interestingly enough – the Titan 1 builds items ‘bottom up’, as displayed in the picture above. Tedd Syao was also at the heart of creating and polishing Kudo3D’s patent for the PSP technique – a ‘Passive Self-Peeling’ technology, which is said to “minimize the separation force, (so that) features as tiny as a strand of hair can be preserved during the printing process” according to company’s website. From Hull’s moment of brilliance to Syao and Dini’s revolutionary ideas, the world of 3D printing has not stopped expanding in the last few decades. As the world continues to open its’ eyes to this method of manufacturing, one can only expect more pioneers to pop up around the world. Courtesy of Adafruit, a New-York based outfit that incorporates 3D printing in certain products, the open-source community has received a major boost.